Have you ever tried to find something in your garage only to walk out and see that it is a complete mess, full of clutter? At that point you feel like just turning around, closing the door and forgetting what you came for. On the other hand, if your garage is clean and organized, you can go and find exactly what you’re looking for, complete your task and have a pleasant experience. 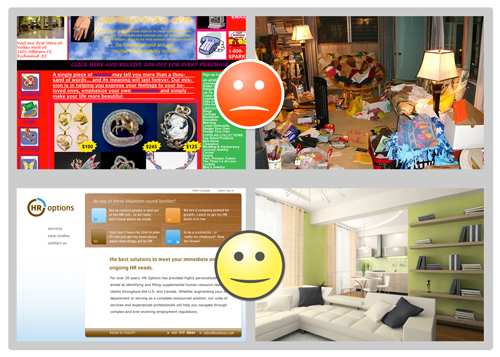 The “messy garage” picture is exactly what it is like for many of your customers when they go to your website, if it is not cleanly designed. If your website appears very “busy”, they may come to it and get overwhelmed, prompting them to turn around and leave. The amount of time it takes for them to leave your site is called a “bounce rate”. Ideally, you want to keep this number low. One way to accomplish this is by having a clean website. Think of it like the “clean garage”, everything is in order and has its place. There is room for you to look around. The same is true with a clean website. When people come to visit they have a pleasant experience and are more likely to spend time looking around at all of your features to find exactly what they came for. 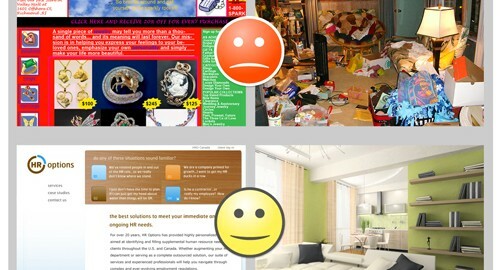 You should be able to tell if your website is clean or not within three seconds of looking at it. Keep each page simple, so that within the first few seconds you can tell exactly what that the page is about. You can have as many pages as you want, just make sure that each page is organized and clear. In fact, the more pages you have the better it is for SEO and the user’s satisfaction. For example, instead of explaining the twenty different services you offer on one page, create a list of those services and link each one to an individual page that gives a full description of that service. This will not only make the homepage look cleaner, but you will be able to give the user more detailed information on a separate page. By having more information on your website, Google will be more likely to rank your website higher for that particular service. If you think your website is too busy, it probably is! Clean it up and you will have more business, as people will be able to find what they came for. With your pages focused on only one service at a time, you will rank better for that service and you are less likely to lose the people that do land on your site because your website is clean. Using Google AdWords To Drive Laser Targeted Traffic How to Get Your Plumbing Company on the Map!